Dr. Hunt earned his BA and DDS from the University of North Carolina at Chapel Hill and is a Fellow of the ICOI. He maintains a private practice in Durham, North Carolina, with an emphasis on aesthetic and implant dentistry. For the past ten years, Dr. Hunt and his staff have organized annual dental mission trips to Haiti and Central America through the East Chapel Hill Rotary Club. 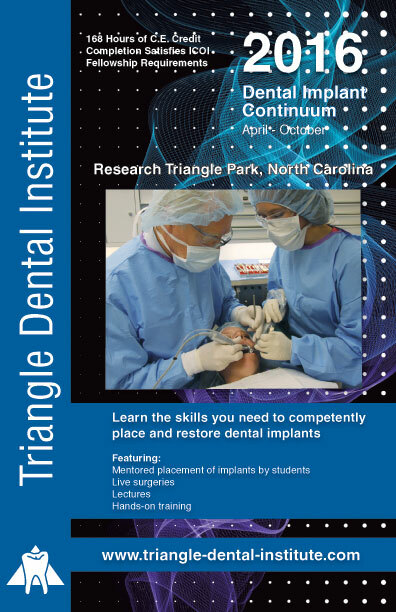 In 2005, Dr. Hunt established the Triangle Dental Institute to educate dentists in dental implants and bone grafting. Dr. Holland received his DDS from the University of North Carolina at Chapel Hill and is a Fellow of the ICOI. He founded Sally Industries, a robotics and animation company, while maintaining a private practice in Jacksonville, Florida. He has developed a dental office management software program, “The Dental Executive,” to improve office efficiency and has produced videos for dental office repair and maintenance. Dr. Simpson is a Diplomate of the American Board of Periodontology. 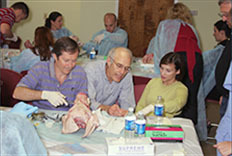 He has been one of UNC-Chapel Hill’s most popular faculty members during his 30-plus year’s association with the Dental School, serving as Department Chair from 1987- 1994. He now maintains a private practice in Raleigh, North Carolina, focusing on periodontics and dental implants. The $1,500 non-refundable deposit will hold your space. The remainder can be paid in two installments, half by April 15 and half by June 10. This entry was posted by Implant Admin on February 24, 2016 at 10:50 am under Uncategorized. You can leave a response, or trackback from your own site. Follow any responses to this entry through the RSS 2.0 feed.